Hai il coraggio di visitare più di 20 dei siti più spaventosi di Filadelfia in questa macabra avventura di camminata all'aperto di 75 minuti. 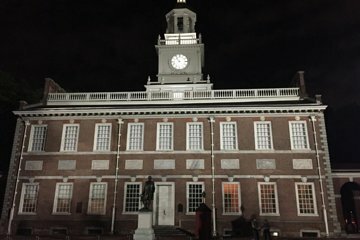 Dai leggendari fantasmi di Independence Hall al paranormale di Pine Street, questo Spiriti del '76 Ghost Tour esplora i fatti infestati e il folclore di Philadelphia. Vivi i monumenti della città al chiaro di luna e ascolta storie spettrali. Percorri le strade acciottolate della città vecchia e ammira le famose location cinematografiche dai thriller del grande schermo "Il sesto senso" e "Il tesoro nazionale". The tour guide was good, but not great. The stories were good, but not great. It was something to do. I enjoyed the ghost tour near Washington, DC much more. I would recommend this tour. It's very educational and entertaining and Travis was an awesome tour guide. The only mishap, which was of no fault to the tour guides was it began to rain during the tour which I guess you could say added spookiness to the tour, but being cold was no fun! Needed to do the walk in the dark. Also need guide in costume. The Ghost tour was a really great experience! There was a really big crowd, but everything was really organized and the people in Mrs.K's were really nice and accomodating with the restrooms. My daughter and her roommate really enjoyed it as well. Our tour guide Jennifer was awesome! I would definitely take the tour again, you cant beat the price as well! Not scary. She had some history to go with old stories of each site. It lasted 2 hours and was a good tour, but not a scary ghost tour. Information/Stories were wonderful. The guide was very interested in hurrying along (a late start to wait for someone to get a drink) to keep to his schedule. He was constantly rushing us along and not caring for our walking comfort. A very enthusiastic tour guide gave us plently of drama! I loved the folk story he told us with his booming and youthful voice. I really appreciate young people after I took this tour, in general. He really knew his stuff and made everybody happy and entertained. I like that it was offered at night in the dark because it made me remember playing outside in the dark when I was a youth with all the walking we did. The tour guide was a very excellent storyteller! I am pleased we talked by and the tour guide gave narration that many of the building were empty but had caretakers. A routine night tour. No emotions at all. Our guide was poor but enthusiastic. It would be better if ghosts and monsters appeared. Had our own personal tour guide as just 2 of us signed up, great! Very educational and interesting.